In case of a power outage or equipment failure, you may find yourself needing to operate your garage door manually. This is a simple procedure, requiring only a few steps and with just a small amount of precaution, you can easily release and reset your own garage door whenever needed. Follow along with us here, or check out the short video linked at the bottom of this how-to guide. It is very important to make sure your garage door is closed before you attempt to put it in manual mode. If there are any faulty or broken springs, the garage door can crash down rapidly, potentially harming anything in it's path and most certainly damage the door itself. If your door is stuck in the open position, we recommend giving us a quick call so we can help remedy the situation safely. The emergency release cord is the red rope that hangs from the door trolley that moves with the door along the rail. The trolley sits on the opener carriage. which moves the door. When the release cord is pulled, it disconnects the trolley from the carriage allowing you to manually move the door. The red cord is attached to a spring lever that can be put in 2 positions. If you intend to continue manual operation, pull the cord toward the door which will keep it from reconnecting to the carriage. Until you re-engage the automatic lift, always ensure to leave you door in the down position. This will ensure your safety and prepare your door for reconnection when your are ready. 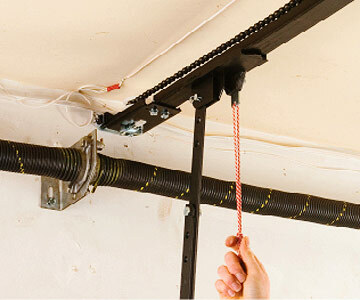 When the time comes to reconnect your garage door, simply pull the emergency release cord back toward the door to re-engage the spring lever. You can then manually move the door to the opener carriage or use the doors remote and it will connect automatically. You will hear a loud click when the trolley attaches back to the carriage. 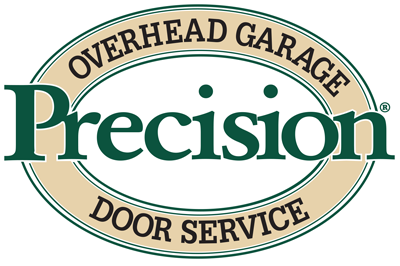 For a demonstration of this process, please watch our YouTube video, �How To Open Your Garage Door Manually.� If you have any problems or if your garage door needs repair, please contact Precision Door of San Diego.